I'd love to mix up some goodies in the mixer! Thanks for hosting the giveaway! Mixers are a great addition to any kitchen. Very nice, please enter me too! Thanx!! Thanks for hosting the giveaway. Of course I want to win. What a generous giveaway! I would so love this to replace my 12 year old mixer that is falling apart (literally held together by duct tape)! Just read your book....LOVE IT!!! Thanks so much for writing it! Whoa awesome giveaway! The only mixer I have is a hand mixer and so stuff flies everywhere when I try to mix. (I end up with butter in the ceiling fan. It's not good.) So this would be awesome! Too fun! I'd love a mixer, especially since I have a habit of letting mine fall off the counter when I walk away and forget I have them on. Anyway, would love to have one in backup. I would love a new mixer! Thanks! Me! Me! Me! Mixers are cool. And so is your book! Hi Lynn, I just stopped by to say Happy St. Patty's Day and here you are having a give-away. Oh how fun! I don't have a stand mixer & I would love one. Thanks for hosting this great giveaway! Count me in Lynn! I need a new mixer! Oooh, pick me! Although, with a newborn and a 2-year-old, getting out of jammies by noon is a stretch! Hmmm - will the mixer actually bake the goodies too or do I still need to do that part? oooh, i want! great giveaway, thanks! Bet I have the most antique mixer in the group: it was a wedding present, 56 years ago. Though it still works just fine, I wouldn't mind having a new one.....who knows what new bells and whistles they've come up with! I would love to win that beater. I was just reading the book "When everything changed" The amazing journey of American women from 1960 to present by Gail Collins and she states that "before beaters a woman had to hand-beat a cake for 3 quarters of an hour". That is exactly why I am glad to live in this era. All things are made simple, so that you may get it done quickly. I would love to win the mixer!! I really need a new one. The book is on my "to buy" list! What a great give away! I just got a new mixer last month but I'd LOVE your book! My children love making cookies with me! They would love this mixer! What a great giveaway! I love making goodies with my children! Ohh! What a great giveaway! Thanks for hosting. Just found your blog ... I'm off to check out more of your fabulousness! Thanks for stopping by. I have your book & I am enjoying it .Please enter me in your fabulous mixer give-away !Please still add me to the book give -away too. I would love to give the copy to my daughter. woo! awesome giveaway both the mixer and the book! I would love a blender!!! Hello my new friend...I am in the middle of writing a book called Queens in Training...we must be linked at the hip! I would love to enter your give away. Please come visit me too...I am Jacqueline from Once Upon a Fairyland which was my childhood home. I came here via Myrna's blog posting on your give away. Good luck to us all! LOL, you like that book? The mixer's very cool but I'm really digging the chance to win the book. My mixer's motor is shot. This would be a great help!!!! 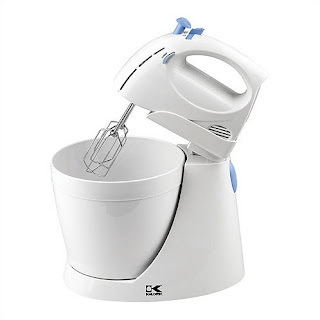 My hand mixer died a while ago and I'd love to replace it with this one. I would LOVE to win this mixer or the book. If I won the mixer, I know the first thing I would bake would be homemade almond cookies for Easter. If I won the book, I would get cozy on the couch and just read! Thanks for the giveaway offers! I recently found your blog and am enjoying it very much. I never thought I would find someone that loved cheese as much as I do. Please choose me to win the mixer. I could really use that. Count me in!!! Nice mixer! Wouldn't mind the book either. Wow it would be nice to win this. I'm newly married and could use a mixer but couldn't afford one. Love the book, would love to have the mixer! I would love a chance at winning this handsome mixer!! How awesome! I would love a mixer on a stand! Thanks much! Found you at Tip Junkie! If it's not too late, this would make a great housewarming gift for the baker in my family! Wow, how did I miss this. Please enter me in your giveaway. How wonderful and how extravagant. I am sorry for the delay but your prize is on its way and should be on the noon stage Monday. There are a few little extras that I didn't mention that went with the book. Please let me know when it arrives.